The Belkin award-winning product lines include Valet Charge Dock for Apple Watch and iPhone, QODE keyboards, and cable and power products. The Company’s product offerings, efficient and enjoyable experience for people to use technology. Belkin launches new product for Valentine's day. as they say tech with style. Belkin announces a new line of fashion-inspired charging cables. MFi certified to ensure iOS compatibility, these Lightning to USB cables are designed to conveniently clip on/off to any bag, purse or keychain. So users are never miss charging of their iPhone, iPod or iPad with this cables. The new fashion cables are available in three design options: a leather tassel, a braided USB clip and a metallic keychain are available. Cables have become a vital accessory and Belkin wants to make it easy, fun & fashionable for people to charge anytime anywhere.Our new collection of fashion charging accessories brings together both creativity and technology in a beautiful way that makes it ‘must-have’ item in everyday lives especially for the rapidly growing fashion conscious population in India. We are delighted to launch them with key partners that share our vision. Made from leather, the MIXIT Lightning to USB Tassel disguises as a purse accessory while cleverly hiding the premium metallic charging cable. 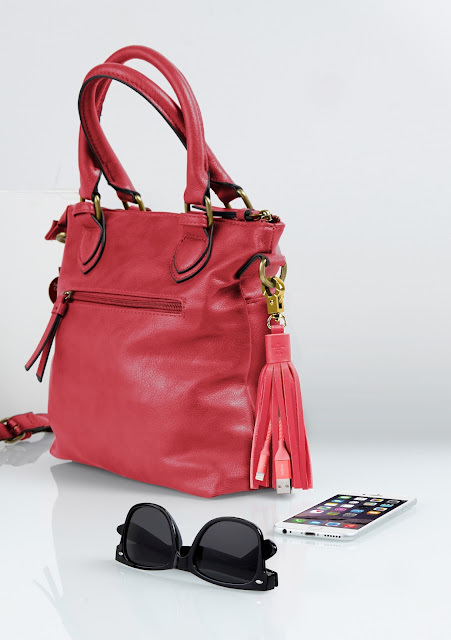 Its fringe design takes a purse from bleak to chic, keeps the cable tidy and prevents it from getting tangled. Available in fog, camel, coral and black, the MIXIT Lightning to USB tassel matches any purse or bag. Here is an example of it. The MIXIT Lightning to USB leather tassel will be available from February in the leading retail and online retailers as well as dealers at an MRP of Rs. 3199. Here is all about latest release from Belkin in beginning of new year. Stay tuned for more. Thank you reading.